Park at Mount Rogers Outfitters Hostel in Damascus VA for a nominal fee. This has to be one of the best backpacks in Virginia. We did it as an aggressive 2.5 day backpack covering 39.6 miles. This backpack has everything, creeks, tough climbs, great vistas, wild ponies, tallest mountain in Virginia, tons of camp sites, open balds, and the list goes on. Double check the weather prior to your hike as it can change dramatically in this area and at these 5000+ elevations. We spent our 1st night at the Mount Rogers Outfitters Hostel in Damascus VA, and also left our car here for a nominal fee. Prior to our trip we called them and setup a shuttle ride from Route 603, the hike end point, back to our car at the Hostel. See thier site for a list of rates. We hiked the Virginia Creeper Trail for the first 12.3 miles to ease in for our first day. The Appalachian Trail north on this section does not have many views. The mileage is not much different so decide if you want to do the A.T. or the Virginia Creeper Trail. 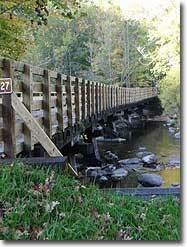 The Virginia Creeper Trail is very picturesque and has multiple bridge crossings over Laurel Creek. NOTE: The printable hike directions we have here does not contain a TOPO map. There are just way to may interconnectiong trails and and details to fit on one page. 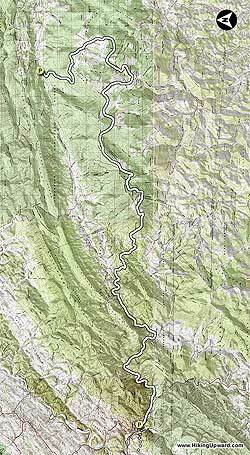 We highly reccomend that you purchase the National Geographic Mount Rogers 786 Map. Also see the alternate 2 day version at the end of this write-up. Mile 0.0 – Start at the Mount Rogers Outfitters Hostel and followed the white blazed Appalacian Trail (A.T.) through Damascus. The A.T. will bear off to the left just outside of town after you have been on the Virginia Creeper Trail for a little while. Stay on the Virginia Creeper Trail for the next 7.4 miles enjoying the many beautiful views of the creek and fields. Mile 7.4 – Taylor's Valley (Route 725). You will see the Creeper Trail Cafe on the right on the other side of the bridge. Continue 4.9 miles to the Creek Junction Trestle. Mile 12.3 – Cross the Creek Junction Trestle, the tallest trestle on the Virginia Creeper Trail. Bear to the left onto the A.T. after crossing the trestle, continue for 1.9 miles to the Lost Mountain Shelter. Take a look at the trestle construction, really cool. Mile 14.2 – Lost Mountain Shelter. Continue north to Route 58 crossing, Summit Cut, in 1.1 miles, this will be mostly down. Mile 15.5 – Day 1 Campsite on left at pine grove, no water here. Walk in just a little ways for enough flat spots for 4-5 tents. Continue north from the campsite, going through fields, and reach the Route 601 Parking in 1.2 miles. Mile 16.7 – Route 601 Parking, room for 4-5 cars, gravel road. Coordinates: 36.6373 -81.6404. Be prepared for some exertion on the next 2.6 miles, gaining almost 1700' and not many switchbacks. Mile 19.3 – Reach Buzzard Rock (5096') after a nice steady climb up the side of Beech Mountain. There are some awesome views here. Go through a section of woods and quickly come out into the open again reaching a spring in 0.8 miles below Whitetop Mtn. Mile 22.6 – Route 600 Parking, coordinates: 36.6465, -81.5832. Cross Route 600 and go through the gate into the open field, be sure to look back over your shoulder on occasion to view Whitetop Mtn. 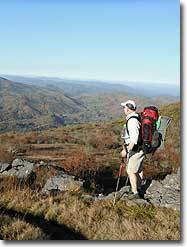 Continue the climb towards Mt Rogers Spur Trail, reaching it in 4 miles. This section is mostly in the woods until just before the spur trail. Some of these woods will make you think you are in Canada. 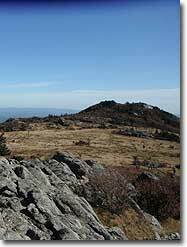 Mile 26.6 – Mt Rogers Spur Trail, tallest Mountain in VA, 5729'. You are there, go to the summit but don't expect any views, the summit is covered with trees. Continue 0.2 miles to the Thomas Knob Shelter. Mile 26.8 – Thomas Knob Shelter. Great place for lunch and to fill up with water about 150 yards behind the shelter where there are also great views. The next 5.1 miles through Grayson Highlands have some of the best views you will find in Virginia. You may also be fortunate enough to see some of the wild ponies. Mile 31.0 – Quebec Branch creek crossing, could fill up here or at Big Wilson Creek near the shelter. Mile 31.9 – Wise Shelter. Plentiful campsites near the shelter. Water source is Big Wilson Creek, about 0.1 miles north on the AT from the shelter. Continue north on the AT from the campsite, through the Little Wilson Creek Wilderness, reaching the Scales Campgound in 3 miles. We hiked this early in the morning, great views even with clouds blowing through . Mile 34.9 – Scales Campgound. Clean pit toilets located here. You will be pretty much in the woods for the hike down to Route 603 parking area. Mile 37.9 – Old Orchard Shelter. Mile 39.6 – Route 603 parking area. Shuttle ride back to Damascus. Day 1 – (11.5 miles) Skip the VA Creeper Trail and have the shuttle take you to Route 58 (Summit Cut). 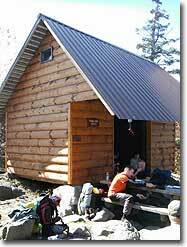 Hike to Thomas Knob Shelter and spend the night near there, tons of campsites just after the shelter. Did this hike over four days with two kids including my 8 year old daughter. She had a very light pack, but 10 miles/day was about all she could do. We had the shuttle take us to fox creek/603 so that we could hike back to the car. We got a lot of rain over the four days, but the springs and streams were all flowing well. I was worried there would be stretches without water but it seemed there was a source often enough that you don't really have to worry about carrying a lot/extra. The shelters all have lots of campsites around them, and while there were definitely decent stretches without any sites, there were enough that you don't really have to worry about where you'll sleep each night if you are tenting and don't want to stay IN the shelters. Lastly, bears. They are having a serious bear problem up there with bears that are getting food and are not scared of people. Bear boxes were installed near Wise and Thomas Knob and they need them at Old Orchard. Even saw an electrified fence that had been setup near Thomas Knob. There were signs everywhere about the problem, but be very careful and take the utmost precautions when eating and storing your food. Even in the first week of August, during the week, and with lots of rain in the forecast, there were still a bunch of hikers out there. I can't even imagine what it's like on weekends or during leaf season. But for good reason: this hike is amazing. I did a modified version of this hike on the A.T. the whole way instead of the Creeper Trail in early Spring 2018. This is truly an epic section of trail, I can't overstate how beautiful it is. The first day out of Damascus is not too exciting but has some killer switchbacks before Saunders Shelter. I camped the first night at the junction of Creeper Trail and A.T. next to a roaring Laurel Creek. In mid-April every spring and stream was full so I never carried much more than 1L of water. (Even at 5000' on Whitetop and Pine mtns there were springs flowing.) Day 2 is when the trail comes out of the woods and you have more open sections in high meadows. The climb to Buzzard Rock was really tough, and then the trail around Whitetop toward Mount Rogers was more rocky and difficult than I expected. Views were insane. 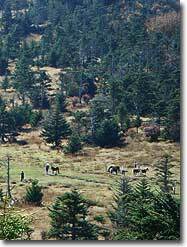 I camped near Thomas Knob on Night 2- there was a small herd of ponies walking around. Day 3 is just view after view, it will make your eyes pop out of your face. Plan extra time for taking pics and video. It was a beautiful Saturday when I came through Grayson Highlands so there were hundreds of people there. Night 3 I camped at Old Orchard shelter which was less crowded than Wise Shelter. I had MRO shuttle pick me up at Fox Creek at 10AM on Day 4 and drive me back to Damascus. Then I hiked south to the state line to check off that A.T. section. My mileage was roughly 15/15/11/9, all on the A.T. This one is a superlative, bucket-list level of backpack trip. If you can't make it to the Grand Canyon this might be a good substitute. This is a hike unlike any other. This was one of my favorites and I look forward to getting back out there again. If you get the chance, you definitely need to check this one out. I recommend doing it in the late fall or winter because the majority of the hike lacks shade - the trail is mostly out in the open with breathtaking views the entire way up. If you are into photography, this is an excellent place to capture some incredible shots with a wide variety of scenery. With the wide open rolling hills, this hike feels less like something in Virginia and more like something out in Colorado. Prepare to be in for a surprise when you make it to the top - I was not expecting what we encountered! There were some cool rock formations along the way, as well as an amusing number of friendly wild ponies roaming around the hillsides. If you're not local, it can be a long drive to the state park, but it is worth every minute of the drive. We (me plus one 1st time hiker and one experienced hiker) stayed at the Hikers Inn in Damascus ($25 for a bunk bed and a shared bathroom) on Friday night. We parked our vehicle at Mt. Rodgers outfitters and coordinated for a pick up on Monday at noon at Route 603 parking area. We followed the Creeper Trail out of town and picked up the AT as the directions state the walk was very nice following the river. We made it to Lost Mountain Shelter early afternoon with no problem. We started out on day 2 with the intention of making it to Wise Shelter however a very cold, wet and windy day slowed us down so we stopped at Thomas Knob Shelter which was very crowded. This left us a long day 3 in order to make it to the pick up location by noon. I recommend planning this as a 4 day or at least coordinating for a later pick up. Highly recommend breakfast at Hey Joe's (great food and great people) and dinner at the Old Mill (again great food and great people).